Since 10' sections require fewer posts and less installation work, the longer sections can reduce project cost. Line posts are the vertical posts between sections that support horizontal rails. Line posts have 2 or 3 rails on both sides and have either 2 or 3 holes. Corner posts can be ordered with 4 or 6 holes depending on the number of rails in the fence. End posts are at the end of the fence (not used for corners). Your choice of peeled or machine hewn. 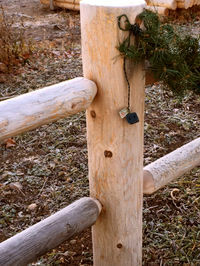 This fence style is made with cedar post from 2" diameter to 6" diameter. You may choose to have them just peeled if no one will be touching it, as it is rough and you could get a splinter. Machine hewn is very smooth, and needs no sanding. The newel post that goes into the ground has holes drilled into them for the rails. The rails have tenon ends. We suggest that whatever size you choose for the newel post, you should skip a size for the rails. For example: 5" newel post and a 3" rail. 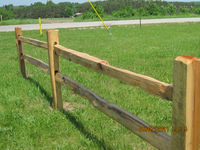 Each post and railing fence is custom made to your specifications.